Stephen Hawking smiles during a symposium in honor of his birthday at the University of Cambridge Jan. 11, 2002 in Cambridge, England. Hawking turned 60-years-old on Jan. 8, 2002 and is the Lucasian Professor of Mathematics, a post once held by Sir Isaac Newton. times — as well as on a number of other popular shows, including Futurama and Star Trek, The Next Generation. One of the most famous scientists of our time has died. Stephen Hawking was a theoretical physicist whose early work on black holes transformed how scientists think about the nature of the universe. But his fame wasn't just a result of his research. He suffered from a neurological disease that made it impossible for him to move his limbs or speak. But that never kept him from thinking or communicating his big ideas to the world. There was even a biopic about his life, "The Theory Of Everything," that won an Academy Award for the actor, Eddie Redmayne, who portrayed Hawking. 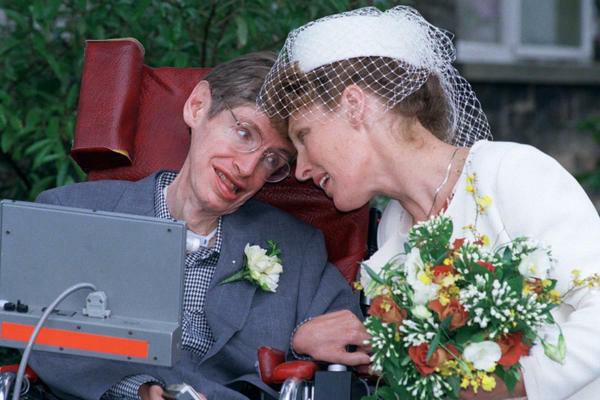 NPR's Joe Palca has this look back at the extraordinary life of Stephen Hawking. JOE PALCA, BYLINE: There aren't very many scientists who've achieved rock-star status - Albert Einstein, OK, but after that? Well, Stephen Hawking was definitely a contender. 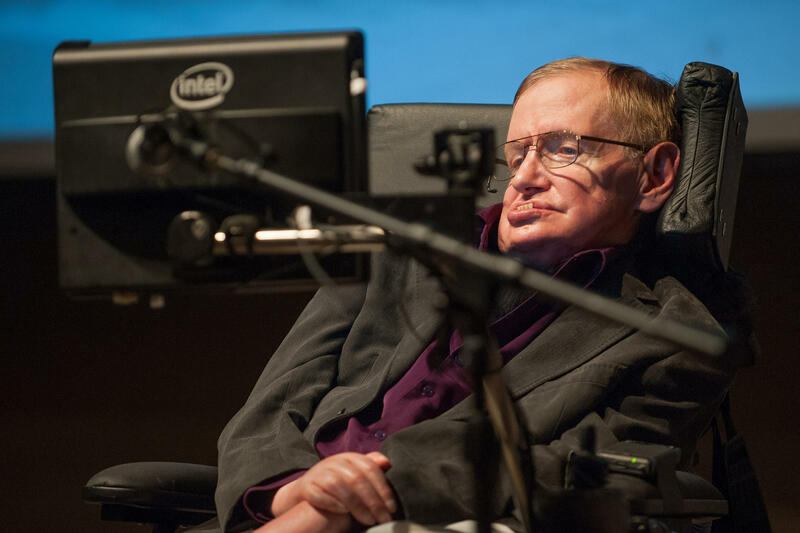 STEPHEN HAWKING: Can you hear me? HAWKING: We now have lots and lots of observational data and a generally-agreed picture of how the universe is evolving. PALCA: When he came to scientific conferences like this one in 1999, the audience hung on every word. And it wasn't just like the scientists who were in awe, the public flocked to him as well. His popular book about his work was a huge bestseller. LEONARD MLODINOW: He agreed that that book, "A Brief History Of Time," was probably the least-read, most-bought book ever. PALCA: Leonard Mlodinow is a physicist and science writer. 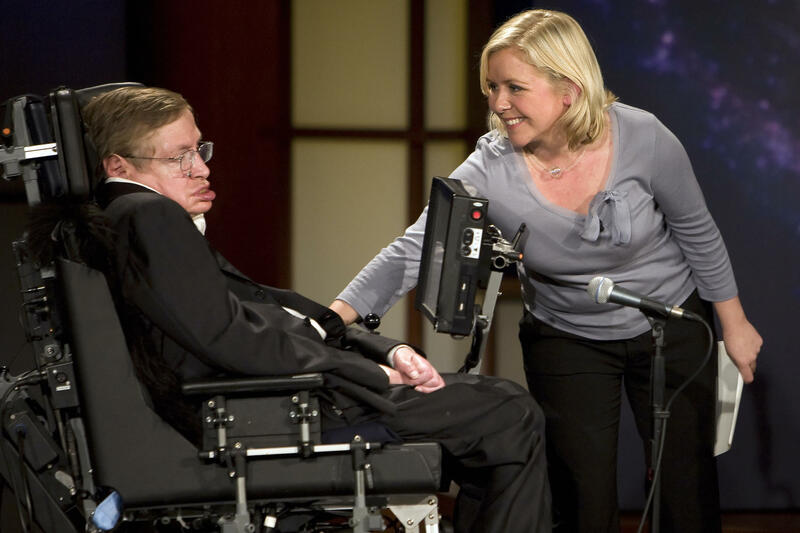 He and Hawking collaborated on a less-technical version of Hawking's first book called "A Briefer History Of Time." And that title hints at what Mlodinow says was a central part of his character - Hawking's sense of humor. MLODINOW: As hard as it was for him to communicate, he would sit there sometimes - he would take five or six minutes to be typing something out. And then when he hit speak and his system voices his words, it would be a joke (laughter). PALCA: That sense of humor, along with his fame, allowed Hawking to land some pretty unusual gigs for a physicist. HAWKING: (As himself) Big deal. My IQ is 280. YEARDLEY SMITH: (As Lisa Simpson) Stephen Hawking. HARRY SHEARER: (As Seymour Skinner) The world's smartest man. SMITH: (As Lisa Simpson) What are you doing here? PALCA: Hawking appeared in "The Simpsons" cartoon show several times as well as a number of other popular shows, including "Star Trek: The Next Generation." So what did this man who reinvisioned the universe really do? What was his science all about? Well, physicists once thought that the immense gravity of a black hole would draw everything in and nothing could escape. But by combining quantum mechanics and the theory of relativity, Hawking showed something astonishing - that theoretically, at least, some kind of particle had to defy what physicists classically expected from gravity and radiate out of black holes. 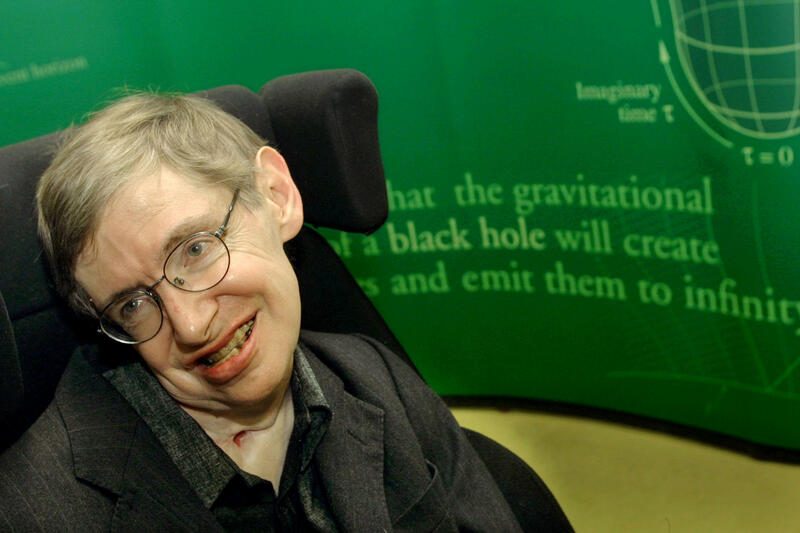 Hawking's work upended scientists' understanding of gravity and raised questions that have yet to be resolved. 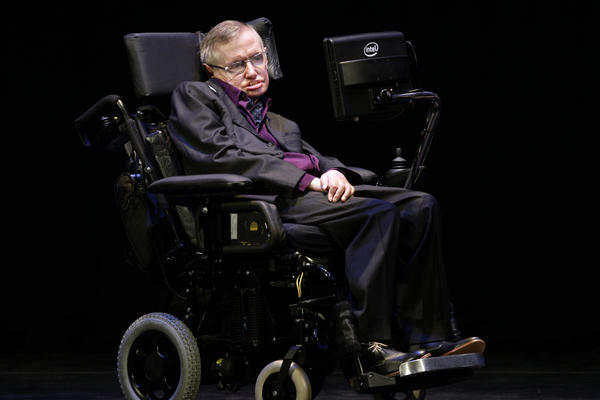 Toward the end of his life, Hawking's disease left him virtually paralyzed. 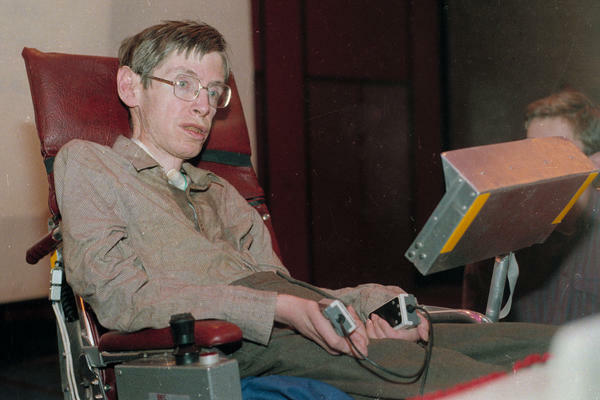 It took an enormous effort for Hawking to make the tiny movements that allowed him to communicate using a computer interface. 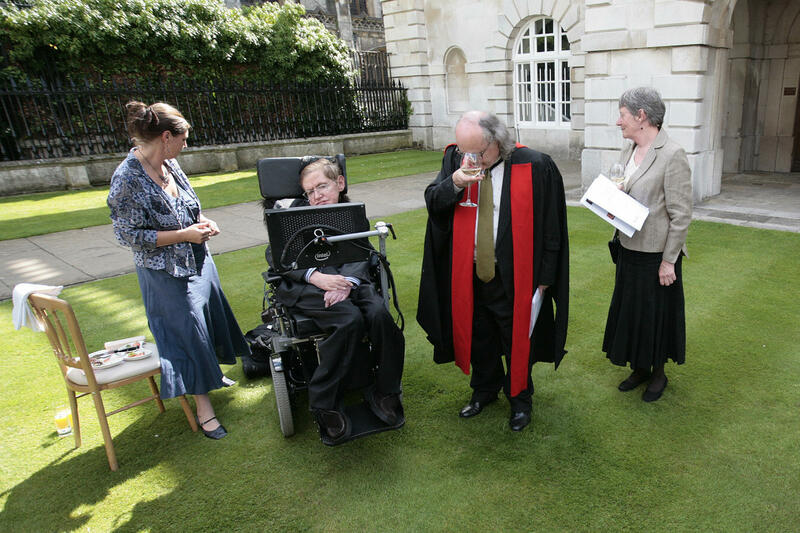 It's tempting to say that Hawking achieved his fame in spite of his physical challenges, but in a way, Hawking's physical challenges may have contributed to his mental prowess. Kip Thorne is a Nobel Prize-winning physicist at the California Institute of Technology who frequently collaborated with Hawking. KIP THORNE: It was because of this handicap that he developed new ways of thinking, new ways of wrapping his brain around things that enabled him to out-think anybody else in the field. PALCA: And he outthought people with great regularity. Throughout his life, Hawking was up for a challenge. For example, in 2007, he accepted an offer from Zero G Corporation to experience weightlessness. The company uses a plane that climbs and dives in such a way that, for 25 seconds at a time, everyone inside the plane is weightless. 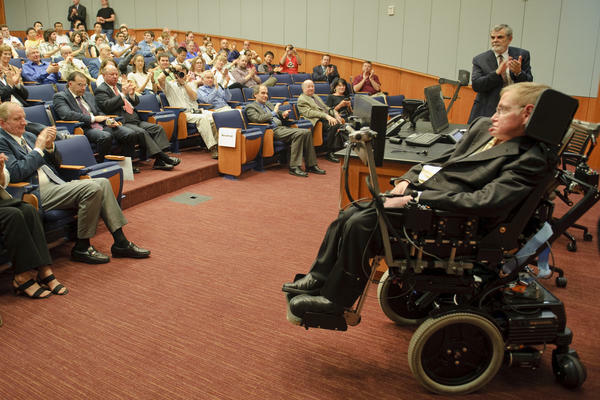 Hawking spoke at a news conference before his flight. 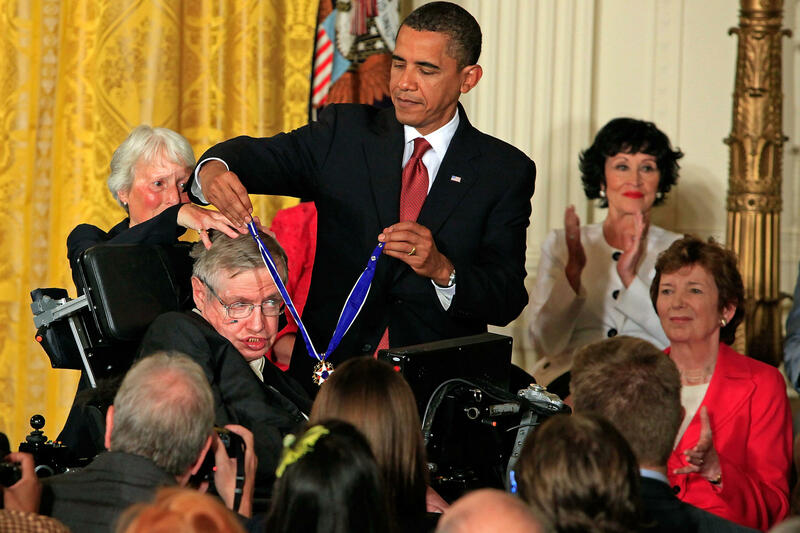 HAWKING: I have been wheelchair-bound for almost four decades, and a chance to float in zero G will be wonderful. PALCA: Pictures taken during the flight showed what appeared to be a very happy physicist floating chair-free around the plane's cabin. Fitting, really, for the scientist who changed the way we think of gravity to spend a few minutes of his life without it. Joe Palca, NPR News. (SOUNDBITE OF FANTOMPOWER'S "BROUGHT TO YOU BY YOURS TRULY") Transcript provided by NPR, Copyright NPR.